For many hunters, elk represents the supreme hunting experience and is very challenging where endurance and skill is concerned. 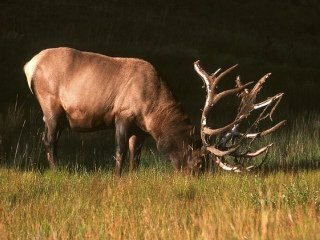 Elk habitats are typically rugged and extremely wild in nature with the best hunting to be found in the northwestern and the southwestern states. Whether it is the Arizona, Colorado, or New Mexico high country or the dense and oftentimes steep coastal forests of Oregon and Washington you are sure to encounter your best elk hunting experiences in any one of these regions. However, quality elk hunting is not entirely relegated to those 5 states. The following are the top places for elk hunting in the US. Oftentimes named the trophy elk hunter’s paradise. Every year, Arizona coughs up some huge trophy bulls and that is why it is considered one of the top elk hunting states in the US. On the downside, it is also one of the toughest states of the bunch to get elk tags in. Some hunters have applied for 10 or more years in a row before ever receiving tags to hunt elk here. Although Colorado is not known for kicking out many trophy bulls, it is known for its prolific annual herd population. On the average, there are some 200,000 elk every year in the state and up to 50,000 are legally allowed to be harvested annually. Additionally, non-residents are not subject to a permit limit when elk hunting in the state. The Lee Metcalf Wilderness is a favorite of professional elk hunting guides which is situated near Yellowstone National Park. The higher Montana backcountry is known for having the most significant populations but you need to be aware that these areas also have large populations of grizzly bears and wolves. Famous for large bulls, this state does have a few quirks where elk hunting is concerned. For instance, they are on an elk tag lottery system like Arizona and it can take up to 10 years to accumulate enough points to obtain tags. Additionally, if you are not a New Mexico resident, you are required by law to hire a guide service to hunt for elk in the state which significantly increases the cost of your hunting vacation. The US northwest is somewhat of a geographical aberration of sorts, especially when it comes to elk hunting. You can hunt in the high, steep timberline regions of the coast or the high desert inland regions towards the central and eastern regions of both states. The coastal mountains feature elk that are bigger with more compact and thicker antlers. Just remember that the coastal mountains of both states have very dense vegetation areas, so you will need to exercise a great deal of caution as footing in these areas can get tentative.